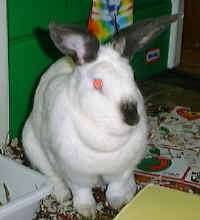 Big Mama is a Californian that weighs around 12 pounds and she was adopted on 6/13/99 at the same time that we got Casper. Big Mama has made quite a trip around before making it to me. Big Mama started out as a rescue from the Ashtabula Humane Society. 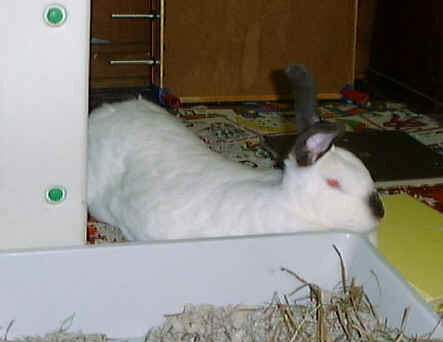 She, along with many other bunnies (Including Vincent and Big Bunny) were confiscated from a man's shed. The bunnies were closed up in this shed with no light at all and were only being fed a few times a week. Within 3 days of rescuing these bunnies, Big Mama and 2 of the other females gave birth to litters of bunnies. When the babies were 8 weeks old, we adopted Daffy. At this point, I had lost track of Big Mama and did not know what happened to her until June. A friend of mine from Petbunny by the name of Jackie announced on the list that she was looking for homes for some of the bunnies at the Warren House Rabbit Sanctuary that she runs. 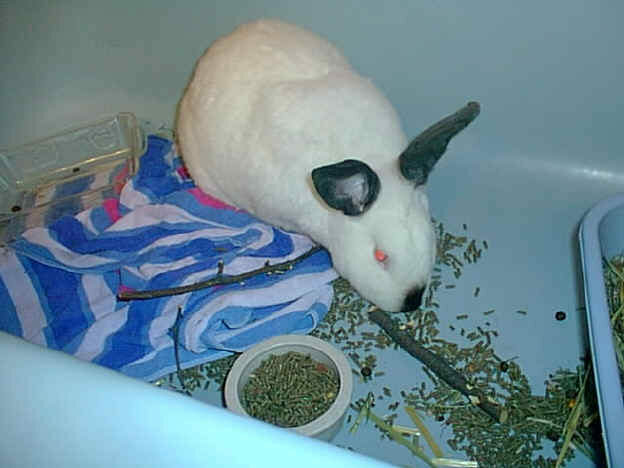 Jacki runs the Western chapter of the Michigan Rabbit Rescue. 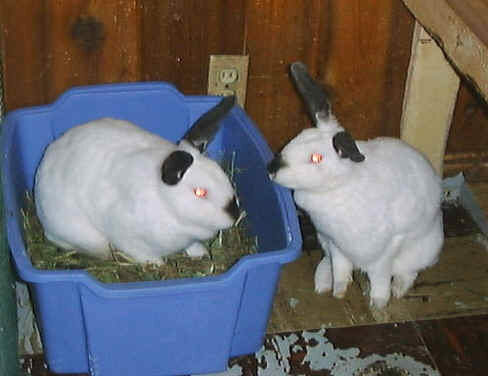 At first, I tried to convince Jackie that she should keep one of the bunnies that was an angora. 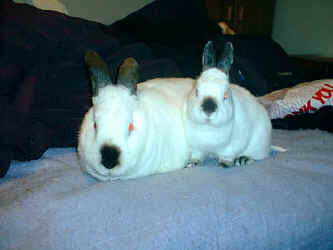 Next thing I know I am agreeing to adopt the angora and Jackie then asks about me taking on Big Mama also! Me being a sucker and Jackie being a good talker and showing no mercy made me decide that I wanted both of the bunnies even though I already had 16! 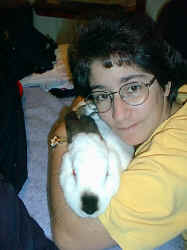 Jackie is a wonderful person who spends her time rescuing bunnies and guinea pigs, getting them spayed and neutered and then finding good homes for them, like mine. 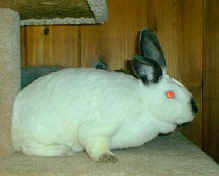 Big Mama had been taken by the woman from the Ashtabula Humane Society to Michigan Rabbit Rescue and adoption where she had been fostered by another woman named Nicole. Jackie drove Casper from where she lives in Michigan to where Nicole lives in Michigan. Nicole then brought both bunnies to Toldeo, Ohio where we drove to meet her and pick up Big Mama and Casper. On 12/9/99, I noticed a large lump on Big Mama's belly. I took her to the vet and he scheduled her for surgery the next day. At first, he thought this lump was a tumor but during surgery, he discovered that it was a very large encapsulated abcess. If you would like to see pictures of Big Mama's lump, click here. Big Mama came through surgery with no problems and I brought her home that night. I checked the incision each day and everything was looking great. Big Mama was eating and pooping and drinking and moving around. On the 3rd day post op, I noticed that Big Mama had pulled out some of her staples and there was an open hole and it looked green inside. I took her right back to the vet and he cleaned it up. It turns out that one of her food pellets she layed on got inside the incision and became mushy. The vet stapled her back up and put her on Clindamycin. Everything continued well for the next 2 days. I noticed that the lump came back in the evening and by the time I took her to the vet the next day, it was almost as large as her original lump. The vet scheduled her for surgery the next morning. She came through the surgery just fine and even sat up afterwards. When the vet put her in the incubator to recover, she had a seizure and her skin and mouth turned blue. The vet began CPR but to no avail. I am very saddened by her loss and only wish I could have done more for her. This is my last picture I took of Big Mama on 12/14/99. It was after her 1st surgery and the incision had to be stapled closed again. You can see that she still looks very healthy and was eating, drinking and pooping and enjoying her new apple sticks that I got from Bunnyluv. 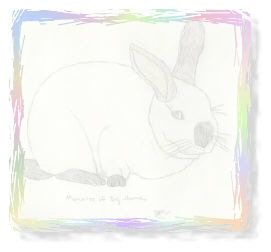 This beautiful drawing and the background were made for me by a friend from Petbunny. Her name is Debra and you can email her at brandylop@tcinternet.net if you would like to tell her what a great job she did. Click on the drawing if you would like to see a full size image.